Would you like some Piquancy with that? Chiles are a wide world of mostly untapped flavors, from the tropical fruit tones of habaneros to deep smoke from moritas to chocolate and dark fruit anchos. Different chiles tend to lend themselves very well to a wide variety of pairings with many different spirits. At the lower end of the piquancy spectrum, ancho chiles (the dried form of poblanos) tend to provide a short burst of moderate heat near the beginning of a cocktail’s progression of flavors. More excitingly, they provide a host of deep, dark, chocolate and dried fruit flavors; think cocoa nibs, figs, plums, and the like. 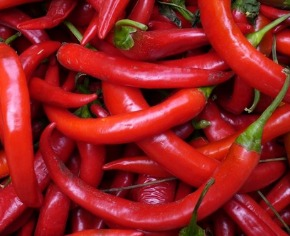 These chiles are ideal for use in a syrup: Break one large ancho chile into small pieces, including the seeds in an infusion into eight ounces of near-boiling water for 6 minutes (An important note: boiling chiles extract more of their “spice,” and is rarely necessary; a fine balance of flavors is achieved by steeping them as a tisane instead of boiling). Strain out the ancho-infused water, and stir to combine with an equal measure of sugar and a pinch of salt. Use this syrup in an old-fashioned with aged rum, rye whiskey, or añejo tequila, complementing with Angostura, orange, or chocolate bitters. The ancho chile will both add levity to the usually syrupy intro as well as a deeply flavorful finish. Increasing in piquancy, moritas (the dried, smoked form of jalapeños) provide a kick of spice from the late middle into finish of a cocktail, making them a beautiful match with acidity to bolster the finish of a sour cocktail. Moderate smoke and moderate spice tends to make these chiles imply a sort of savoriness as well, which pairs beautifully with spirits which have a touch of oaked sweetness. Using these chiles in an alternate acidic preparation I call an aqua agrumes, we will substitute the final product for lemon or lime juice in a Sour. Split two morita chiles in half, steeping them in eight ounces of near-boiling water for 5 minutes before straining. Add two teaspoons of a vintner’s acid blend (citric, malic and tartaric acid powders; readily available at homebrew supply stores or online) and a small pinch of salt to this morita-infused water, stirring to incorporate. Combine 2 oz of rye whiskey, .75 oz of a light brown sugar syrup, and .75 oz of this morita agrumes, shaking and double-straining up into a coupe. The morita chile provides an accentuation of the rye whiskey’s natural spice, making for a one-two punch of flavor from beginning to end. The most potent of chiles in this selection, habaneros give an immediate burst of heat with a diminishing linger. Acidity is almost necessary to balance these, and sweetness pairs well with the tropical fruit nature of these hot and flavorful chiles. This makes them a beautiful match for tiki-style drinks. Infuse the chiles into high-proof alcohol to create a tincture; slice two habaneros into thin rings before infusing into eight ounces of 190-proof grain alcohol, either by cooking sous vide for 12 minutes at 120 degrees Fahrenheit or steeping for 3 days, shaking occasionally. A few dashes of this tincture seem tailor-made for Jeff Berry’s “Planet of the Apes:” Build 1 oz dark Jamaican rum, .5 oz amber 151-proof rum (Cruzan, Bacardi, etc. ), 1 oz pineapple juice, 1 oz orange juice, .75 oz crème de banana, .5 oz lime juice, and 3 dashes of our habanero tincture in a shaker tin, fill with ice, shake well, and pour unstrained into a tall glass, garnishing with any flower, umbrella, or sea creature is within reach.